Judith “Judy” Arlene Corray, age 79, passed away Tuesday, November 20, 2018, at Country Health Care & Rehab, surrounded by loving family. Visitation will be from 4 - 6pm on Sunday, December 2 and a Memorial Service will be held at 10am on Monday, December 3, both at Renner-Wikoff Chapel, 1900 Philo Rd, Urbana, IL 61802. Per Judy’s wishes, cremation rites have been accorded and burial will take place at a later date. The oldest of five children, Judy was born at Mercy Hospital in Urbana on September 29, 1939, to William Paul, Sr. and Erlene B. (Cook) Cedusky. She married Roger M. Corray on October 26, 1957 in Urbana. Judy is survived by her husband of 61 years, Roger Corray of St. Joseph; daughter Elizabeth “Katie” (Terry) Andersen of St. Joseph, grandchild Kimberly Andersen and great-grandchildren, Lindsey and Jacob Rowland of Hampton, Virginia, grandchild Brian (Amanda) Andersen and great-grandchild Brooke of Mahomet; daughter Debbie (Max) Corray Calvo of St. Joseph and grandchild Emily Corray of Urbana; son Michael (Denise) Corray and grandchildren, Aidan, Jaren and Shannon Corray of Charleston; sister Jaci (Bob) Nickelson-Smith of Urbana; sister-in-law Norma Pittman of Bayles Lake; sister-in-law Judy Cedusky of Winter Haven, Florida; brother-in-law Robert Corray of St. Joseph; and many loving nieces, nephews, family members, and close friends, near and far. She was preceded in death by her parents, one sister, Frances Koster, and two brothers, William Paul Cedusky, Jr. and Daniel Cedusky. 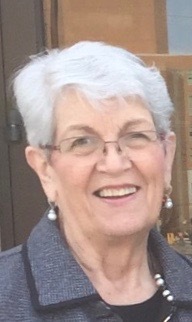 Judy touched countless people in her professional life, which included many years at The Andersons Grain Elevator, over 30 years as a Mary Kay consultant, and ended with a long, successful career at the University of Illinois where she was an active member of The Secretariat and the Business and Professional Women’s Club. After retirement, she remained involved as a member of the St. Joseph Village Gardeners and St. Joseph Home Extension. Judy was a strong supporter of her children, enthusiastically helping whenever and wherever she could with their businesses, and she loved attending all school events for her grandchildren. She will be greatly missed by all who knew her, as she was a kind, thoughtful, loving wife, sister, mother, grandmother, great-grandmother, aunt and friend. Roger and family thank Barnes-Jewish Hospital, Country Health Care & Rehab, and Transitions Hospice for their care during Judy’s last weeks and days. In lieu of flowers, memorial donations may be made to The Foundation for Barnes-Jewish Hospital/Siteman Cancer Center (https://www.foundationbarnesjewish.org/) 1001 Highlands Plaza Drive West, Suite 140, St. Louis, MO 63110-1337.